VIVE’s VR headset is marketed very differently from the competitor’s. VIVE and Oculus are the two big competitors, especially when it comes to VR headsets. The flagship Oculus Rift came out a couple of years ago. 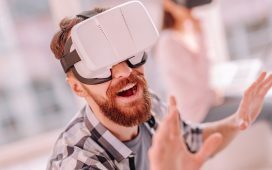 Since then they’ve been focusing largely on stand-alone hardware including the Oculus Go and the upcoming Oculus Quest. VIVE, on the other hand, has already launched its updated flagship VIVE Pro and the stand alone VIVE FOCUS. They’ve also recently announced their FOCUS PLUS to release around the same time as the Oculus Quest. So what kind of VR technology is the FOCUS PLUS packing and how will it stack up against the Oculus Quest? We’re not going to talk about the Quest a whole lot in this article. Largely because we’ve seen it coming since autumn and we’ve already talked about it. If you’re just interested in the FOCUS, read on. If you’re deciding between buying a Quest or a FOCUS PLUS this spring, read up on the Quest here. Before we get into the VR technology behind to FOCUS PLUS, let’s talk numbers. The FOCUS PLUS is set to release on April 15, around the same time as the Oculus Quest. FOCUS PLUS has a price tag of $800 keeping in line with VIVE’s tendency to not be shy about price. To be clear, we don’t have a firm price tag for the Quest yet. However, assuming that the cost settles between Go and Rift, it’ll be around half the price of FOCUS PLUS. VR headsets for industry are often more expensive than those for entertainment. And VIVE is definitely positioning the FOCUS PLUS as an industry VR headset. The Oculus Rift launched primarily as a gaming platform. The VIVE and VIVE PRO have largely followed suit. Similarly, most of the buzz around the Quest has been in terms of gaming. That’s the first area where the FOCUS PLUS stands apart. The FOCUS PLUS is selling itself as a VR solution for businesses. VR technology in business, especially design and marketing, have been rapidly growing fields. Still, it’s a little surprising to see VIVE going in this direction. Other solutions like HoloLens and Magic Leap have been largely filling that space. The actual VR technology involved in the FOCUS PLUS isn’t particularly business oriented. According to the webpage VIVE devoted to it, it has better graphics, better hand controls, and a more comfortable headset. Most of the business aspect comes from software. FOCUS PLUS has settings for simplifying options and commands as well as a “kiosk mode” for presentations. In essence, it can go from VR tool to one-person presentation pretty quickly. It’s unclear whether the software updates pushed for the FOCUS PLUS are going to become available for older models. One frustrating thing is that VIVE hasn’t told us about any of the applications for the FOCUS PLUS. One of the main ways that companies posture their VR headsets as industry or entertainment is by pitching available titles. So far, VIVE has told us that the FOCUS PRO is industry targeted but hasn’t given us any titles. In a way that’s to be expected considering it was just announced. However, they have little time to advertise before the release date next month. Comparing the Quest and the FOCUS PLUS is like comparing apples and a mysterious fruit being marketed as an orange. The Quest was announced months ago. We know it’s marketed for games. And we know what games will be available for it. We can also guess how much it will cost, and it isn’t much. The FOCUS PLUS was announced a few days ago. We know it’s marketed for business, but we don’t really know why. We know it’s going to be very expensive. The question is, are the few business-related toggles worth the price tag?